This luscious cheesecake, topped with blueberry sauce, proves that counting carbs doesn't mean that delicious tasting desserts can't be part of the equation. Spray bottom and side of a 9-inch pie plate with vegetable cooking spray; sprinkle with bread crumbs and tilt to cover evenly. In a large bowl, with an electric mixer, beat cream cheese, eggs, milk, granulated sweetener and vanilla until smooth. Carefully pour into crumb-coated pie plate and smooth the top. Bake until set in the center, 18 to 20 minutes. Cool 10 minutes, then spread the Sour Cream Topping over the top and bake 7 minutes longer. Cool to room temperature on a wire rack, then refrigerate until cold. Serve with Blueberry Sauce. For Sour Cream Topping: Stir together all ingredients in a small bowl until well blended. For Blueberry Sauce: Combine all the ingredients in a medium-size saucepan, and cook over medium heat until berries are soft, about 5 minutes. Chill well before serving over the cheesecake. *Bread crumbs are optional. If made without bread crumbs, subtract 1 gram carbohydrate per portion. 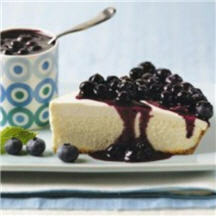 Nutritional Information Per Serving (1/8 of portion of cheesecake, including 1 1/2 tablespoons blueberry sauce): 413 calories; 13 g carbohydrate; 36 g total fat (22 g saturated fat); 1 g fiber.